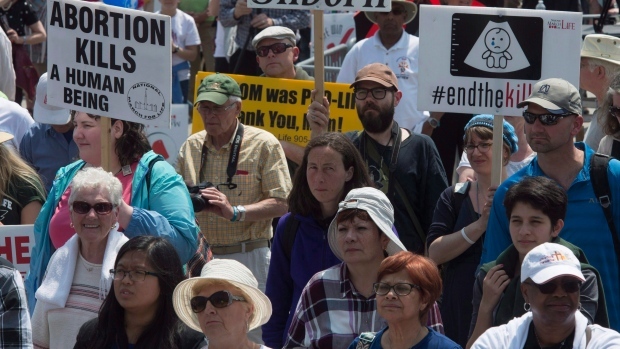 OTTAWA -- Anti-abortion activists say the controversy surrounding Prime Minister Justin Trudeau's changes to the Canada Summer Jobs program has given added momentum to their cause. Thousands of demonstrators gathered on Parliament Hill on Thursday for the annual March For Life rally. Campaign Life Coalition spokesman Matthew Wojciechowski said this year's turnout was bigger than last year and he attributed that to the summer jobs controversy. "It gave people more reason to be upset about the current situation and has motivated them to do something," he said. "A lot of business owners and people in this audience have definitely been affected by this -- whether it's students or employers saying they cannot sign the attestation." The Liberal government this year required that organizations seeking funding under the program check a box affirming their support for constitutional rights and the right to reproductive choice, including access to abortion. 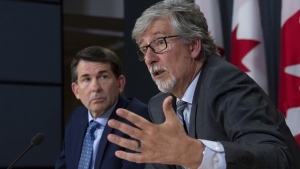 Of 42,708 applications to the program, 1,559 were deemed ineligible because of the attestation requirement, said a government answer to a Commons order paper question tabled by Conservative MP Bob Zimmer. Wojciechowski called the attestation requirement "totalitarian" and said it's "extremely upsetting" that the government is forcing taxpayers to endorse its ideology. People in the pro-life movement are also upset with Trudeau for his government's decision to fund abortion overseas, he added. A number of protesters on the Hill said businesses and groups applying for funding shouldn't be denied because of their beliefs. "Everybody has to conform to the belief system that Justin Trudeau or the current government has in order to be a citizen and receive grants that other citizens receive. It doesn't make any sense," said Sharon Siderius, 42. Siderius said she wouldn't want her kids to get a summer job under those grants because she disagrees with the policy. She said at church they talk about the policy "quite a bit" because it's an assault on their freedom as Christians. Another rally participant, Steve Eckert, 35, who is training to become a priest, said the fact that abortion rights are the benchmark for whether groups obtain a summer jobs grant is "absurd."